Passive House, a concept that originated in the late 1980s in Germany, is increasingly being adopted around the world as an energy-efficient building design solution to rising energy costs. Passivhaus, meaning passive building in German, is a form of sustainable architecture based on the idea of using intelligent building design to reduce the amount of heating energy. This is achieved through several design solutions including installing heavy layers of insulation around all exterior surfaces; using double or triple glazed windows with thermally-broken or timber frames; constructing a highly-airtight building envelope; and integrating mechanical ventilation systems based on heat-exchange technology. Together, all these elements contribute to a building that remains largely unaffected by external conditions. A Passive House is capable of maintaining its interior at a comfortable 20-25°C level naturally. Standard Passive Houses use only around 1/20 of the heating and cooling energy required by non-Passive models. Many of the Passive Houses in the world today are found in Germany and German-speaking regions, as well as colder regions such as Scandinavia. Passive building is relied upon in these regions mainly to reduce heating costs in winter, eliminate cold air draughts and provide excellent acoustic isolation. Conceptually, Passive House is independent of climate and region, and is increasingly being considered in Australia as a solution to reduce energy costs. However, the challenges are different in the harsh climatic extremes of Australia where energy consumption is high throughout the year because of the requirement for cooling in summer and heating in winter. Passive House construction costs are also high in Australia unlike in Germany where the acceptance of Passive design has resulted in Passive buildings costing only 5-7 per cent higher to construct than regular buildings. With increasing interest in, and greater acceptance of Passive design concepts, Passive House construction costs are expected to gradually reduce in Australia. 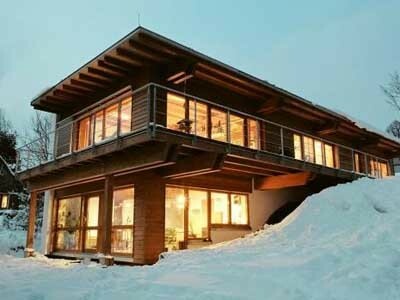 Image: A Passive House is capable of maintaining its interior at a comfortable 20-25°C level naturally.